Fashion stylists and personal shoppers, Aimée Gowland and Corrie Pellerin of ALG Style, provide some stylish November fashion finds! Whether it’s time to revamp your own personal look, or the look of your home, here are top six picks to pull everything together. You go girl! 1. Do Pinterest and Etsy make you feel as if the crafty types are mocking you? Fake it ’til you make it, and personalize your Thanksgiving tablescape with these chalk-board place mats, place cards and table runner. Have a dear friend with gorgeous handwriting make it all look pretty. And if your new in-laws cannot tolerate the seating arrangement, simply erase and renegotiate that seating chart. 2. 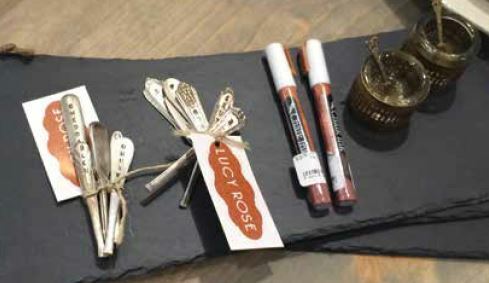 Need the perfect hostess gift? Or perhaps you want to show a little love to your designated driver on Thanksgiving Eve? These mixologist candles smell divine (and not at all like the bar room), and they’re calorie- and hangover-free! We applaud a good fur. Whether they’re real, faux, black or blue, furs make you feel nothing short of fabulous. Pair one with your pjs for cozy lounging while binge watching your favorite Netflix series, or slip one over a pretty cocktail ensemble for a glamorous night out. 4. Invest in the quintessential fall item; boots are eternally on trend. Whether it be a rough and tumble moto boot with a bit of fringe or a thigh-high pair of stunners, a good boot can make you feel like you can conquer the world and kick some serious bootie (pun intended). This deep taupe/gray bootie with a stacked, square heel is minimalist, structured, chic and comfortable. Pair it with everything from your favorite boyfriend jeans to black leggings and skinny jeans. 5. If you’re dashing from the dining room to stir your duck gumbo on Thanksgiving Day, your ensemble needs to have both form and function. Keep your outfit from lacking flavor. These bold pieces add the perfect amount of spice to every get-up. Sparkly stunners can be worn alone or layered together for a show-stopping statement. 6. With our mad skills, we can dress you up — but styling a table is not our strong suit … we make a mockery of Martha Stewart. An exquisite centerpiece, consisting of kale, cymbidium orchids, corn broom and sunflower pods, contained in a rustic burlap pouch, is the creation of Robin Defraites, owner of Grow With Us Florist in Old Metairie. Another unique option is this ensemble of blush cymbidium orchids, mokara orchids, spray roses, fresh wheat and dahlies, in a rustic birch-bark container.